What makes Everybody Dance different from other schools? What I really wanted to create was a dance social club which also happens to offer the quality instruction of the best dance schools. A fun place to go where everyone knows everyone else. 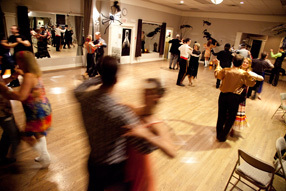 A friendly place where diverse people mix together sharing one common passion: the love of dance! Most importantly, each student is treated as an individual. No two people think and learn in exactly the same way, so your dance instruction will be customized to best suit the way you learn. You will not be locked into a program for a specified length of time, but for how short or long a period of time necessary for you. We are pleased to say that we have been successful in these areas and most importantly, our students are learning to dance well. Breaking the dances down into simple components and using those as building blocks, we’re making sure that not only is your dancing fun, it’s also easy. We’ll keep it light, too, with lots of humour, so we can all share a laugh or two!